Since 1969, Thomas FX has been proud to support the world’s top special effects coordinators and technicians. We are acknowledged to be a world leader in artificial snow effects, and snow products. 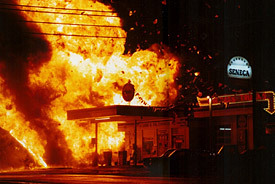 We also supply film and entertainment projects with production supplies, pyrotechnics, custom breakaway glass, production services, and mechanical effects rental equipment. 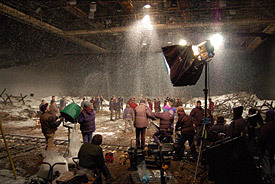 In addition, we own and operate a purpose built 5,000 sq ft special effects film studio with 3,500 sq ft of adjoining production offices, and offer services to the film industry such as: FX Tech Referrals; special effects product customization; the development of new special effects products; and new & used equipment sourcing. Thomas FX has acquired a great deal of expertise in global logistics, as well as supply chain management, and we are capable of supporting film crews working at any production location in the world with critical production supplies, delivered on budget, and on schedule. Our inventory includes more than 4,000 quality film industry products and we ship from one central location to serve the urgent needs of special effects professionals. As our business has grown, so have our services to the film industry. For example, over the years many of our unique consumer retail products have become popular with set dec and prop department buyers. Seasonal set dec and prop items and unique themed décor is available for every season of the year on a year-round basis. We also stock professional makeup effects and a large assortment of theatrical contact lenses. Our products have been used on feature films such as: Watchmen, Terminator Salvation, Shutter Island, 2012 Farewell Atlantis, Superman 1, Alive, Jumanji, Cliffhanger, Medicine Man, X-Men, Fantastic Four, I Robot, Disney's Eight Below, Day After Tomorrow, Night at the Museum, Catwoman, Seven Years In Tibet, Ace Ventura and thousands of other film projects. We also provide production supplies and special effects equipment to television, and commercial projects such as: Smallville, Twilight Zone, Supernatural, Dead Like Me, The 4400, The L Word, Men In Trees, Traveler, Jeremiah, Andromeda Strain, and many more. In addition, we sell new and used special effects equipment and offer consignment equipment marketing services. Let the team at Thomas FX take some of the pressure off. Contact us today and experience a level of service that will make your job, and your life, much easier. At Thomas FX, the experience gained through more than 40 years on the front lines of the film industry makes a difference you will notice, and appreciate!